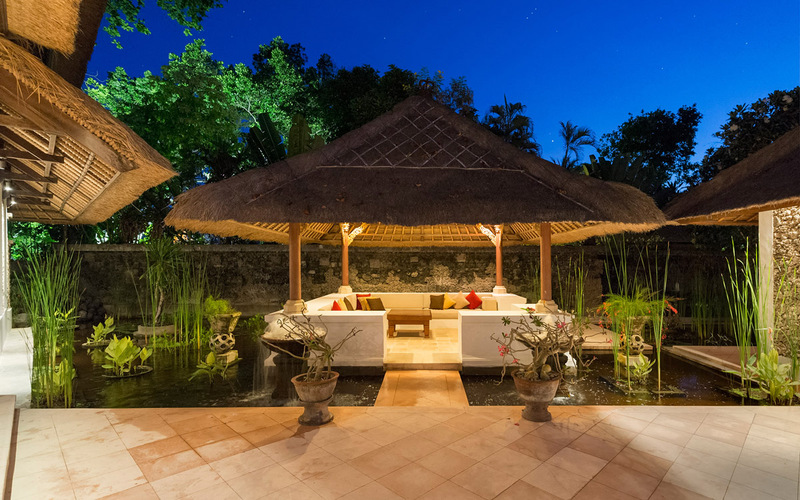 From $ 2,327AUD per night We have direct contracts with most villa owners. We don't add any booking fees. We are 100% transparent with no nasty surprises. 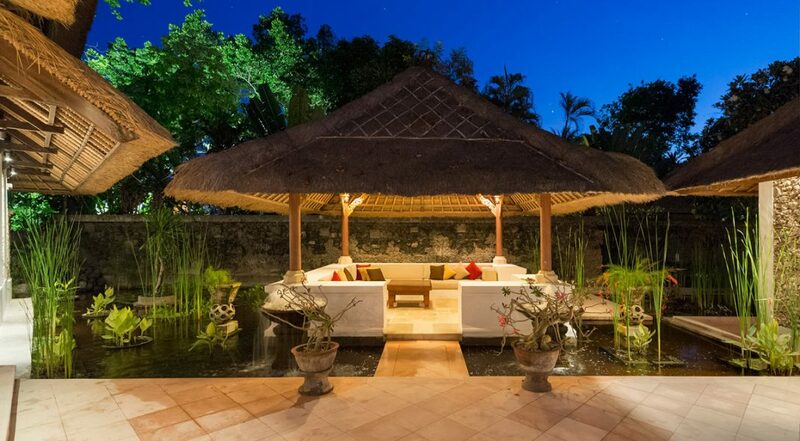 WOW factor villa right on Sanur beach - rent this now! 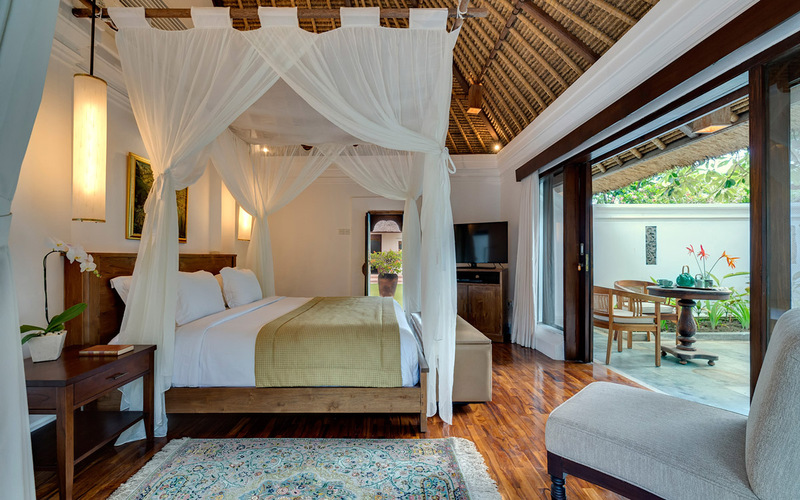 This is really amazing value considering your getting a luxurious private 9 bedroom villa; fully staffed , chef & butler that’s right on the beach! 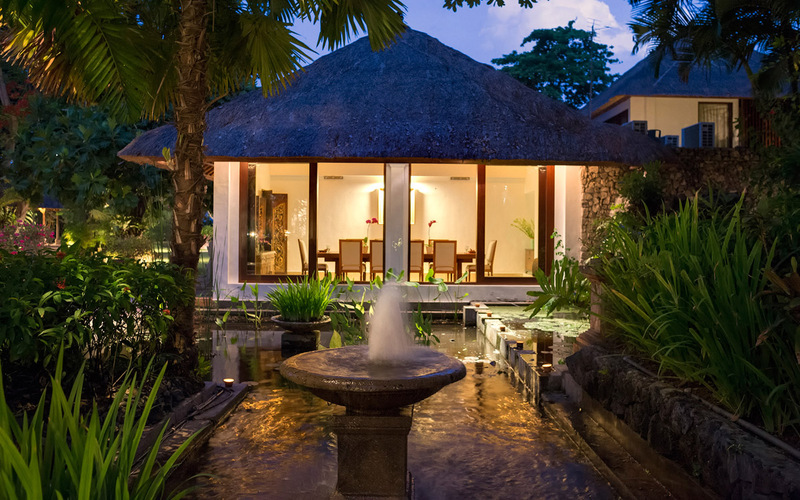 Ideal for large groups or families wanting to be in a gorgeous Balinese tropical setting – the kids will love the swimming pool! 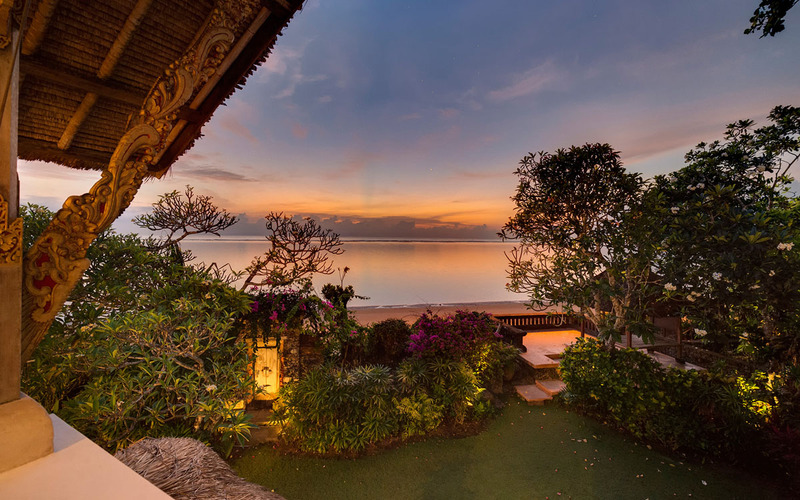 Villa Batujimbar is a 9 bedroom Sanur holiday villa rental & is a luxurious beachfront holiday villa estate, located in the tranquil seaside tourist precinct of Sanur. 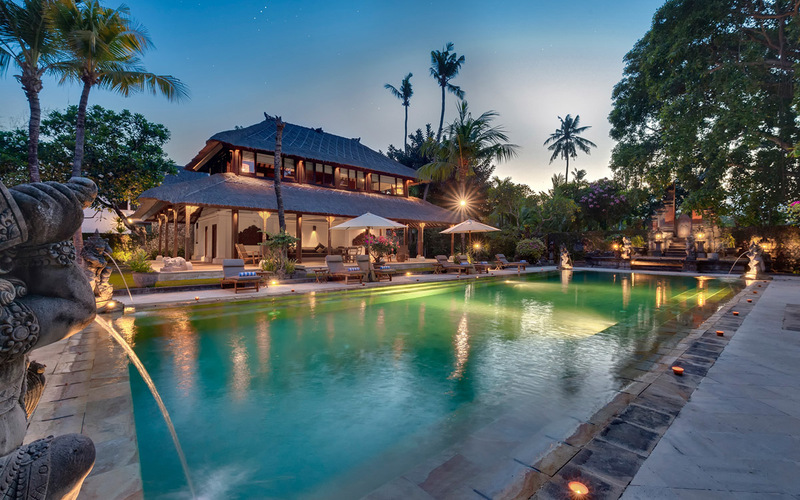 This preferred Bali holiday location for many Europeans and families with children is a peaceful retreat with white sandy beaches and calm waters great for casual swimming. 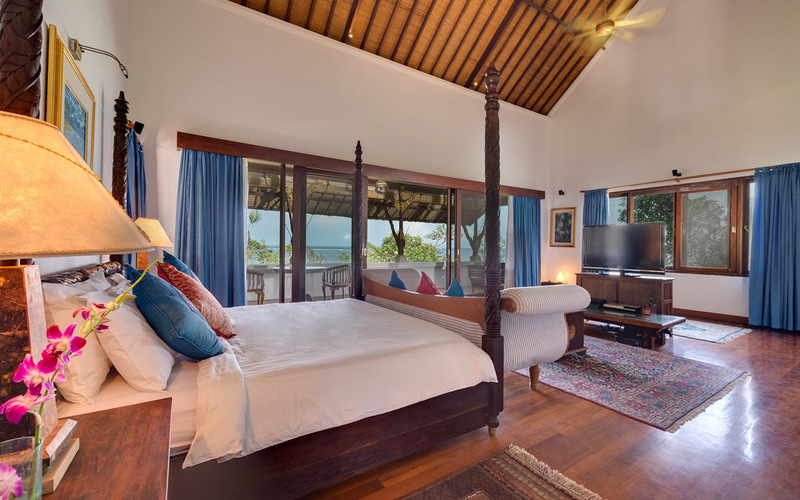 Featuring 8 opulent bedrooms, Villa Batujimbar has been a holiday abode to many of the world’s rich and famous and even royalty. 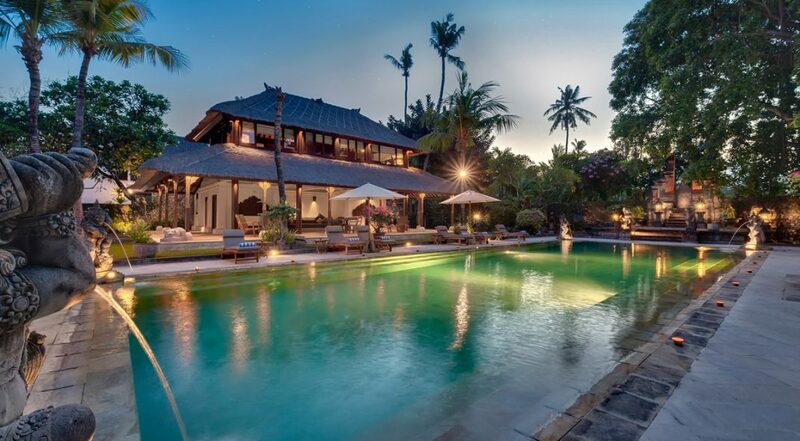 This is the perfect villa to host a wedding or special event and at the same time suitable for large families and groups of friends looking for that unique Bali holiday experience. 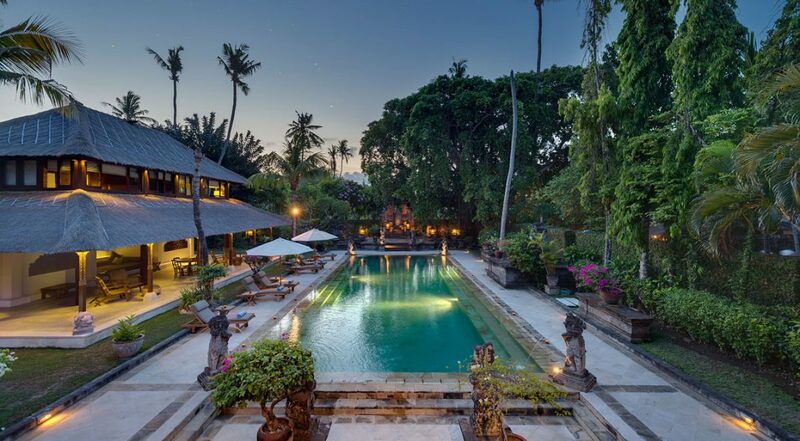 If you holiday here you will be pleased to know so did: Mick Jagger, Yoko Ono, Sting and royal families of Britain and Malaysia. 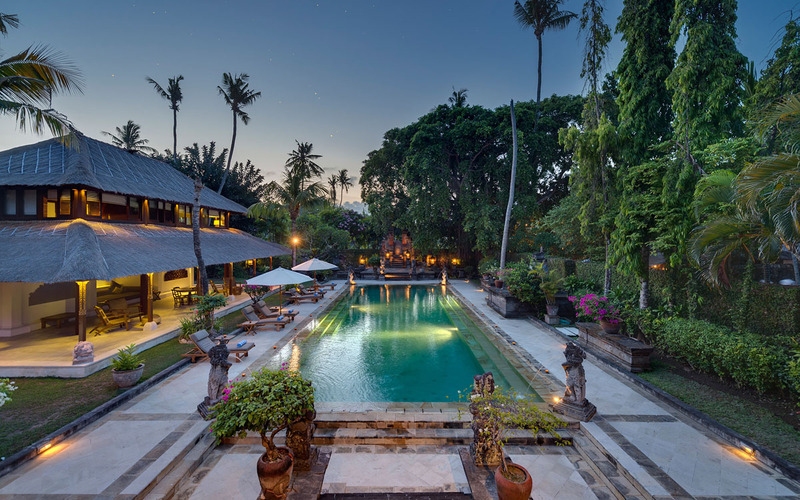 Villa Batujimbar has an enormous garden that stretches from the point of entry all the way through to the white sands of Sanur Beach. 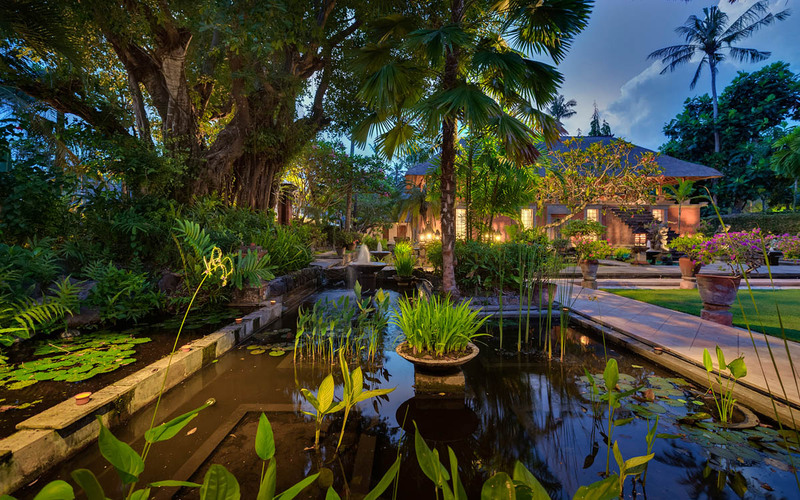 An expansive manicured lawn is flanked by an array of mature tropical plants and trees, ancient stone statues and water features pass water into calming koi ponds with flowering water lilies. 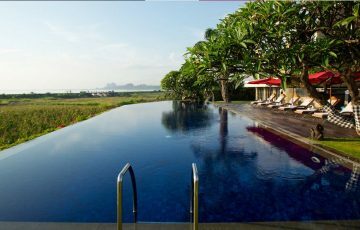 The outstretched private pool 20 meters in length is perfect for swimming a few vigorous laps or just floating in until all your troubles are whisked away. 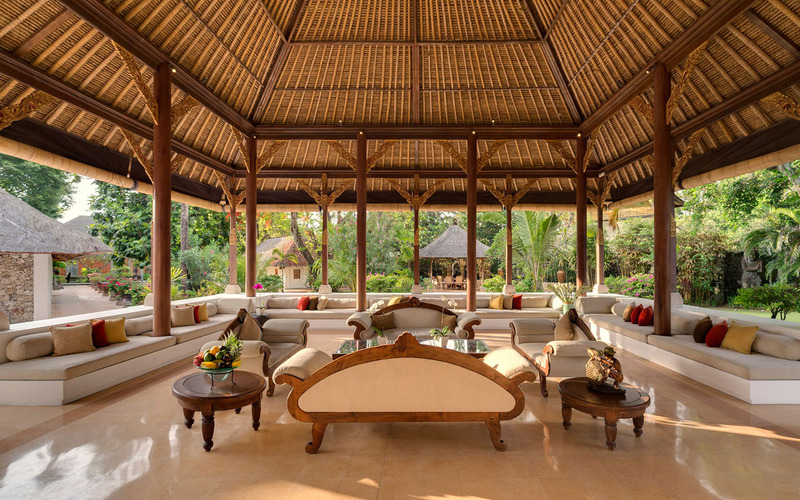 Take a lie down on the poolside sun loungers and enjoy the warmth of the tropical sun or stretch out in the floating gazebo out of the sun. 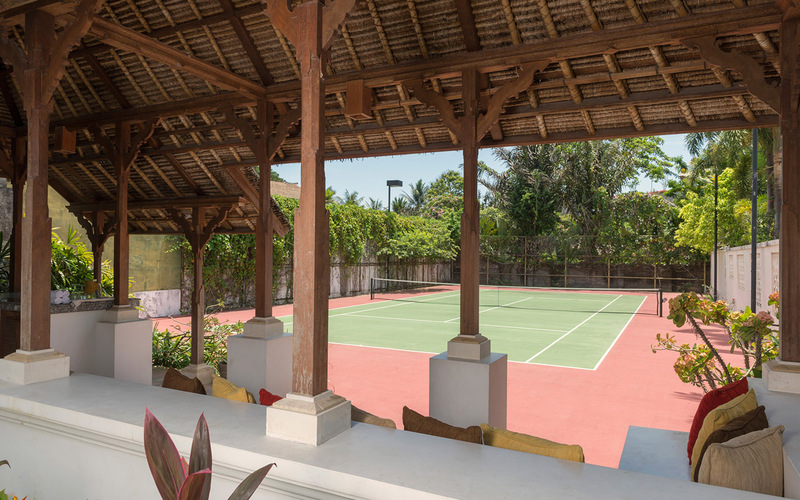 There are more sun loungers and another gazebo providing views of the ocean across to the Island of Lembongan and if you’re in the mood a private tennis court provides some sporting fun. 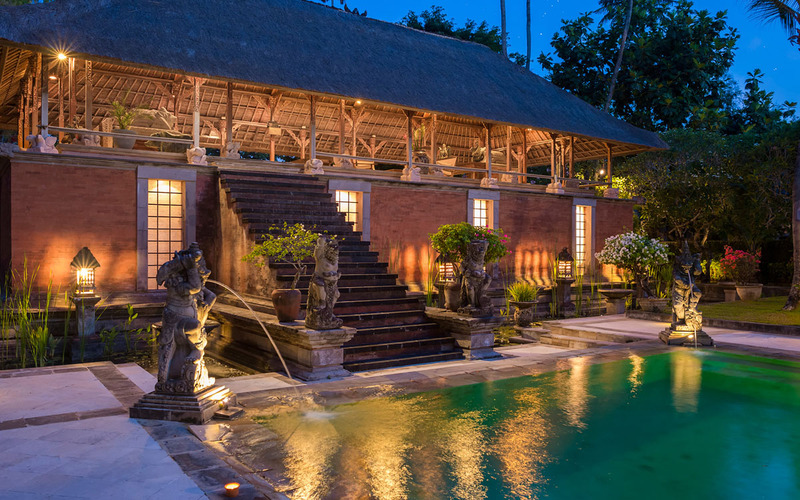 A traditional Balinese pavilion featuring ancient design elements is elaborately decorated with golden pillars and a traditional alang-alang thatched roof. 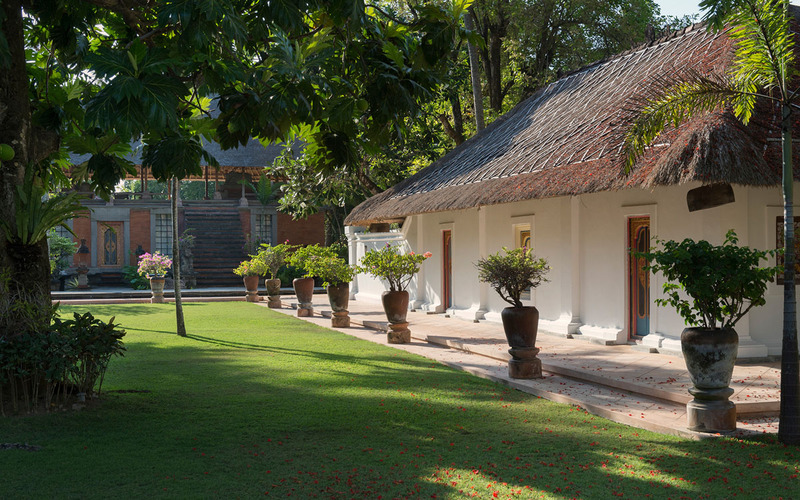 The space is beautifully decorated with an array of antique artifacts and delicate Asian ornaments. 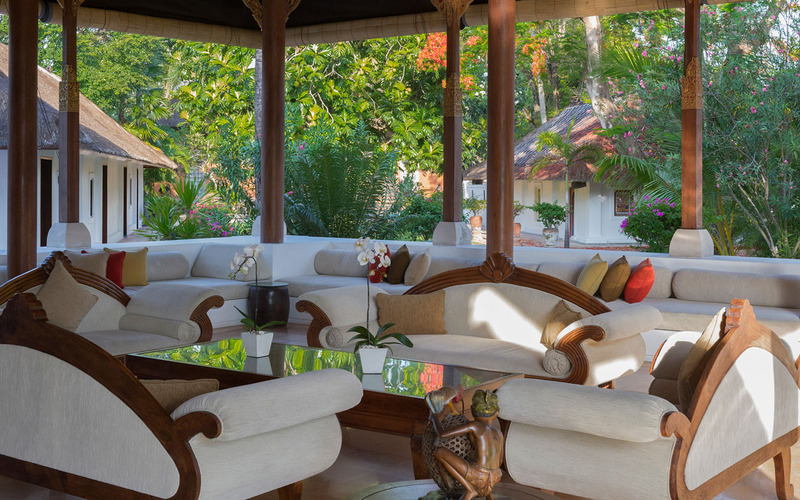 The open air space has a regal feel about it, sea breezes flow through and are circulated by large fans, guests will enjoy relaxing on the large built in sofas taking in the beautiful pieces of fine art and decorations. 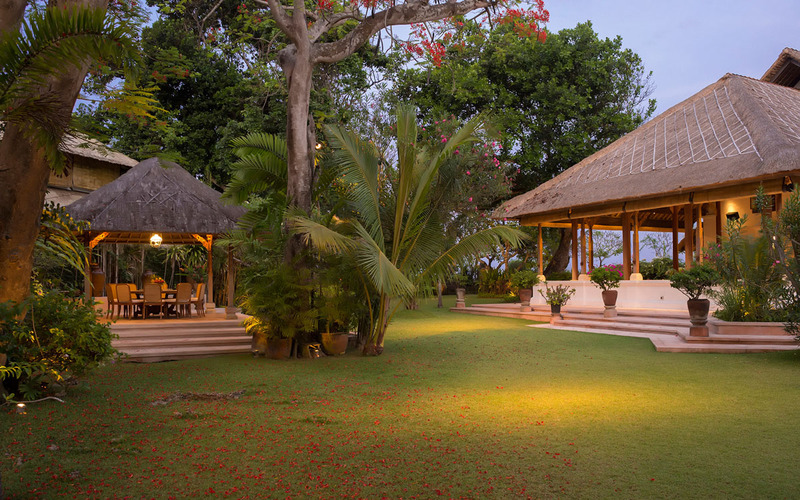 There is a second open air seating gazebo closer to the beach where you can enjoy an afternoon high tea or maybe a refreshing cocktail. 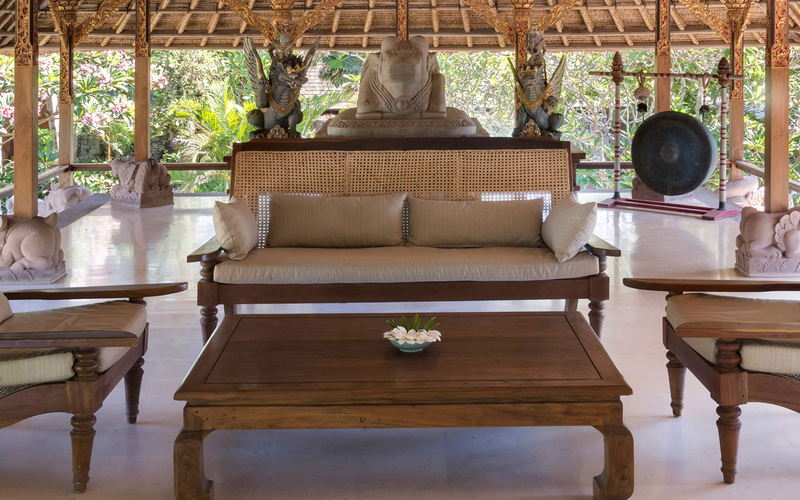 The fully equipped gymnasium will help you burn off the delicious meals prepared by the team of chefs that will serve you from morning until night, every day. 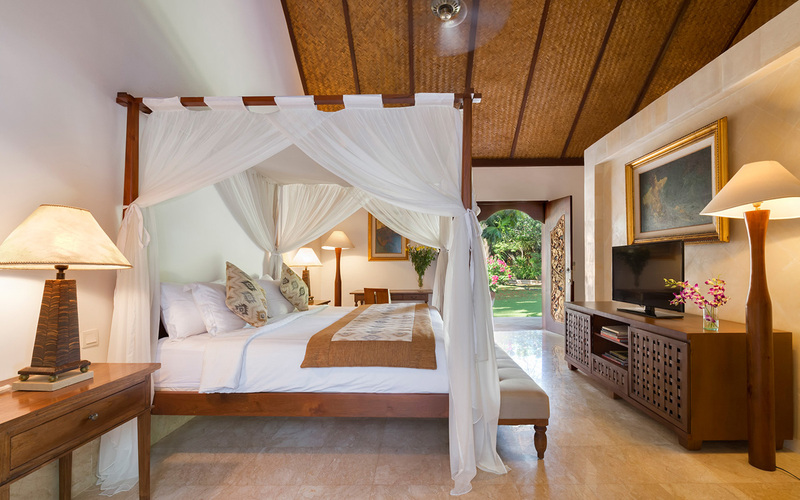 The villa features two master suites fit for a king, its four poster canopied king size beds will provide you with a relaxing slumber. 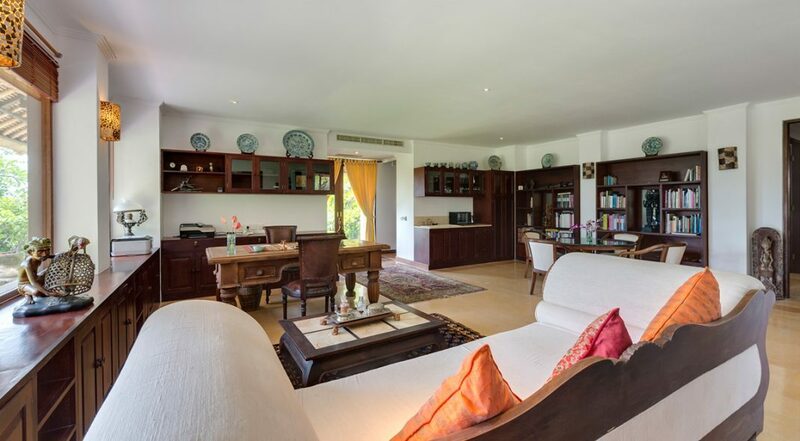 Featuring beautiful marble floors these bedrooms open to gorgeous tropical gardens along with modern amenities including huge flat-screens with Cable TV and DVD players. 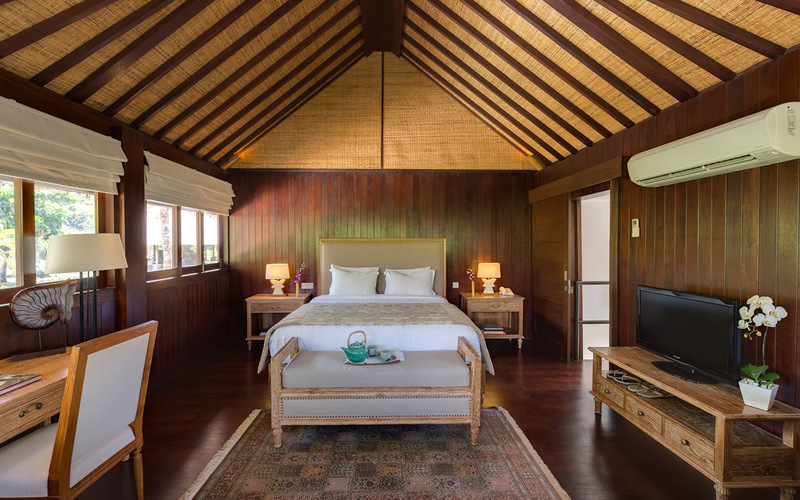 The staff will replenish your private mini bar daily and there are large robes, safety boxes and glamorous en-suite bathrooms. 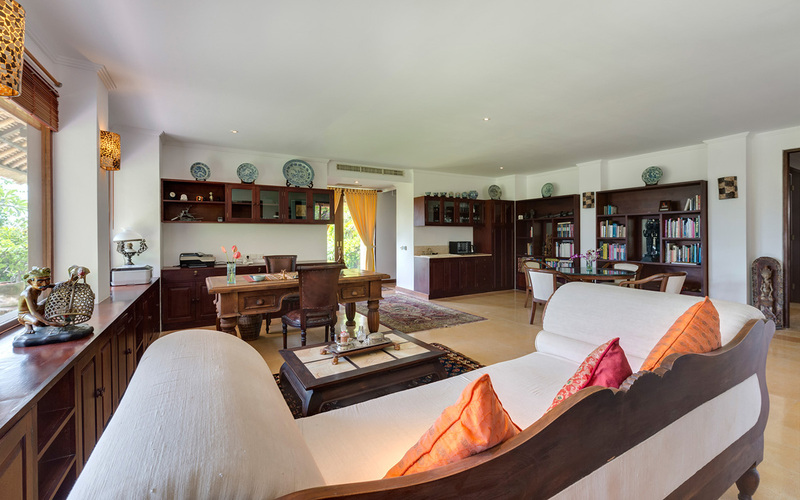 Six more guest suites are spread throughout the expansive estate housed in private accommodation pavilions. 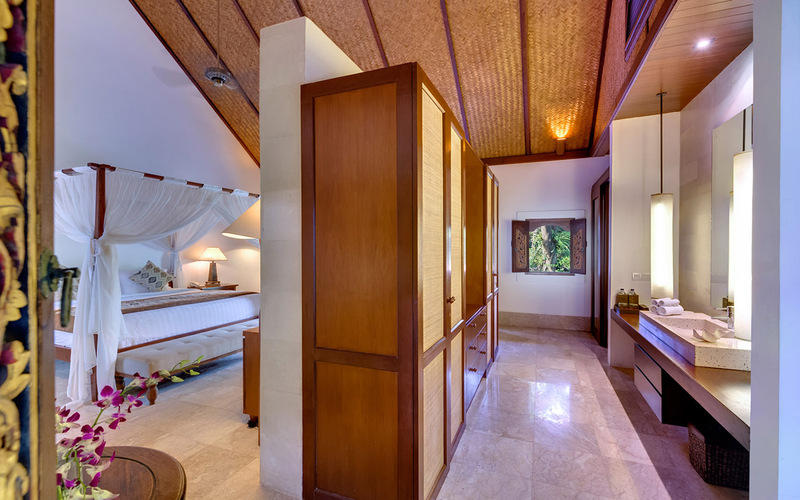 Fully air-conditioned these rooms feature king size beds and all the modern amenities of the two master suites. 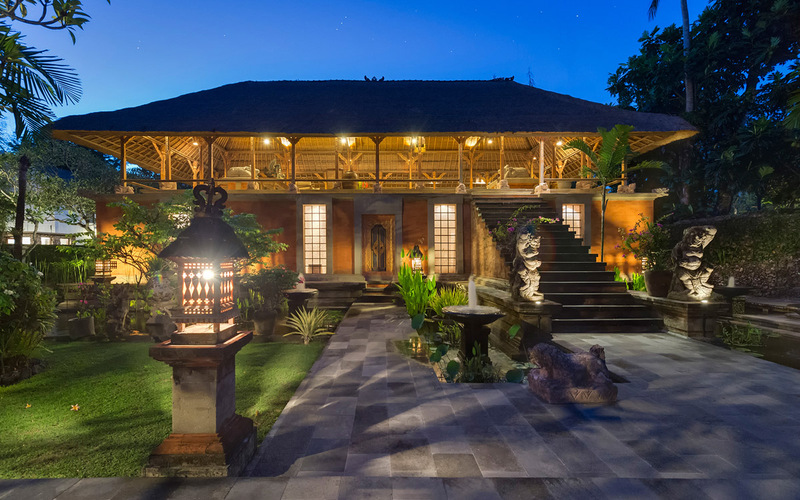 An energetic team of highly trained hospitality experts at Villa Batujimbar are ready to cater to your every need. 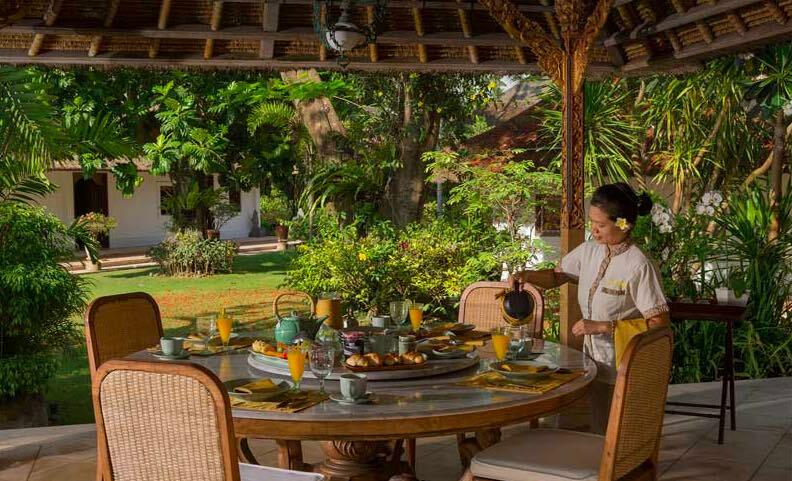 The villa manager oversees the team of butlers, masterful chefs and extensive housekeeping staff. 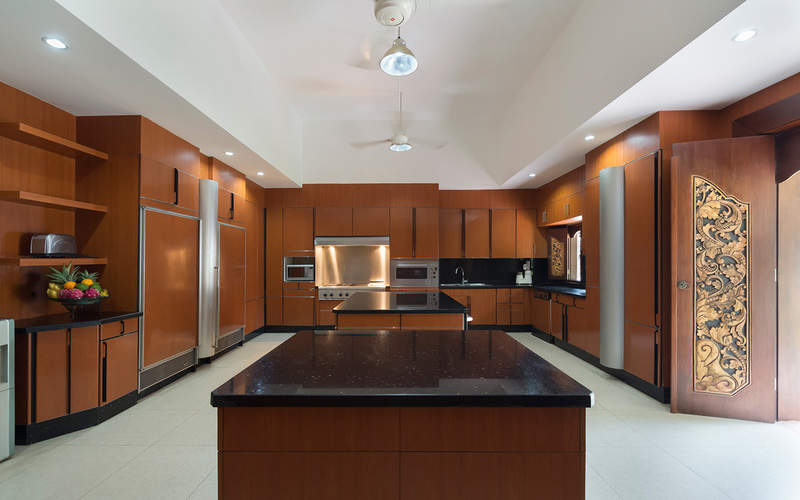 The kitchen can provide room service or communal dining for guests and there is 24 hour security look after the entire complex. 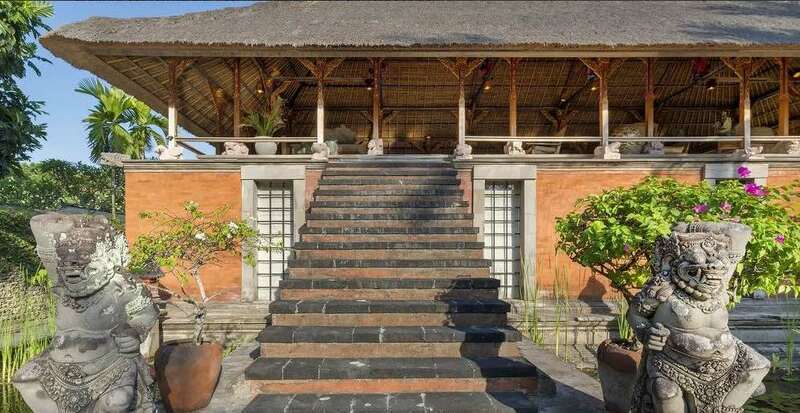 Immediately outside the villa the main street of Sanur is full of great little restaurants and cafes, Hardy’s Supermarket cater to imported items and fresh produce along with ATM’s. 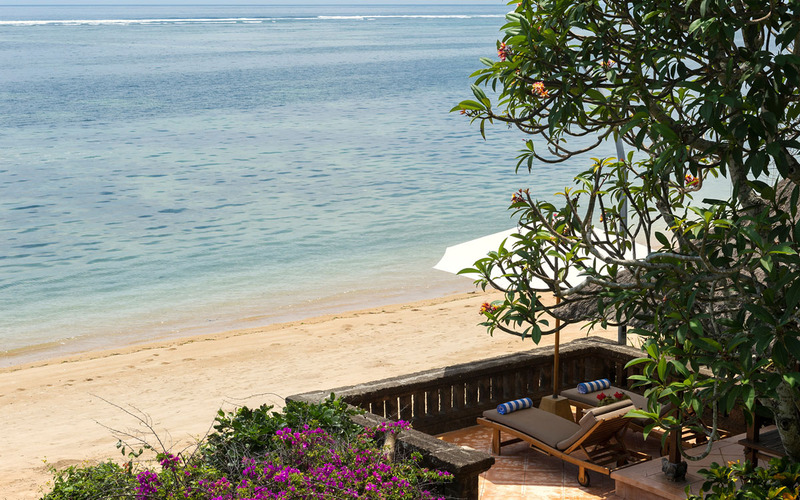 On the beach side of the villa a walking path allows you to take long strolls in either direction where you will find lots of seafood restaurants and cafes overlooking the ocean. 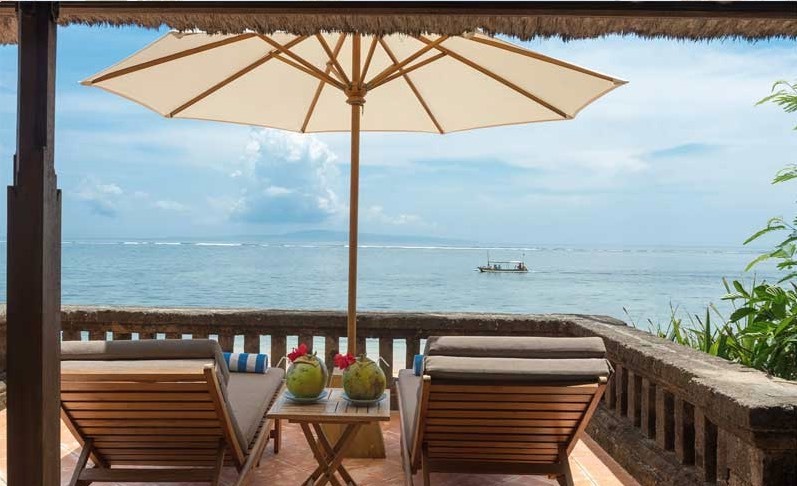 The beach is right on your doorstep and the water is calm for swimming and also a popular spot for kite surfing and you can take a boat from here across to Lembongan Island. 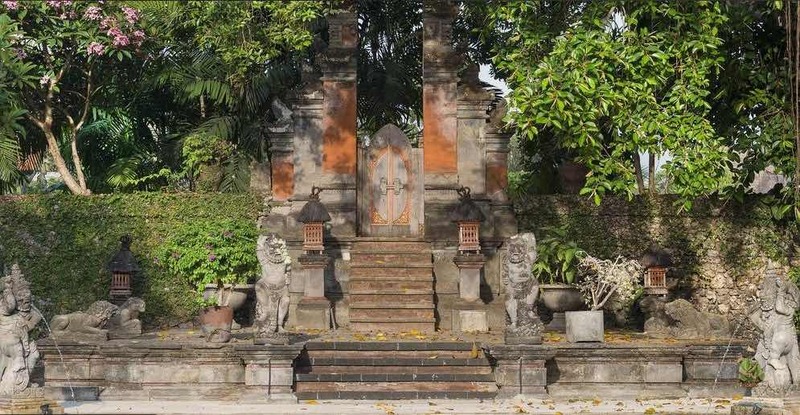 From Sanur, Ubud is only 30 minutes by car, great to for a day trip to explore art galleries and ancient cultural sites. 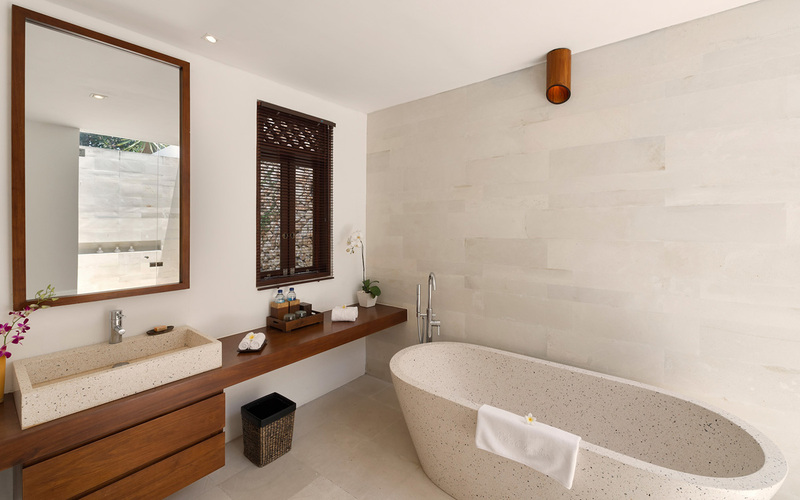 To view other luxurious beach front Sanur Villas or our full range of Bali villas please browse this website or contact our reservation team. 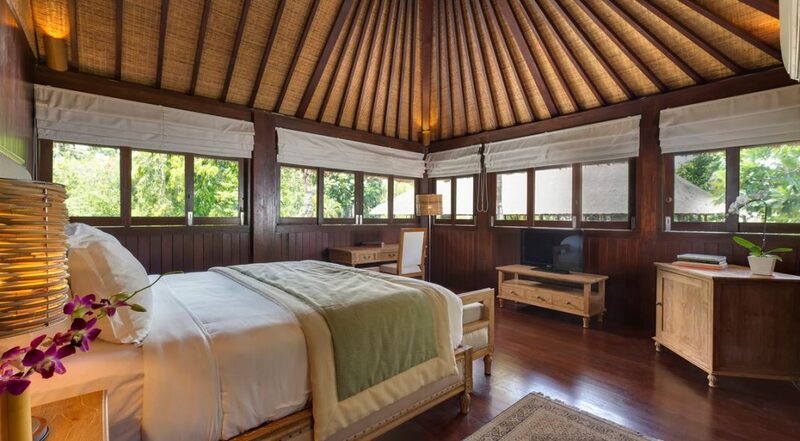 This is a really popular Sanur villa so please book Villa Batujimbar well ahead especially if your planning a trip to Bali during the Australian school or public holidays. Weddings and special events for up to 180 people can be arranged – make sure you speak to our reservation team about our exclusive & fully customised wedding planning service. We spent 10 of the most incredible days here with another family. We there were 9 of us in total and we really liked the fact that we had the beach right in front of the villa. 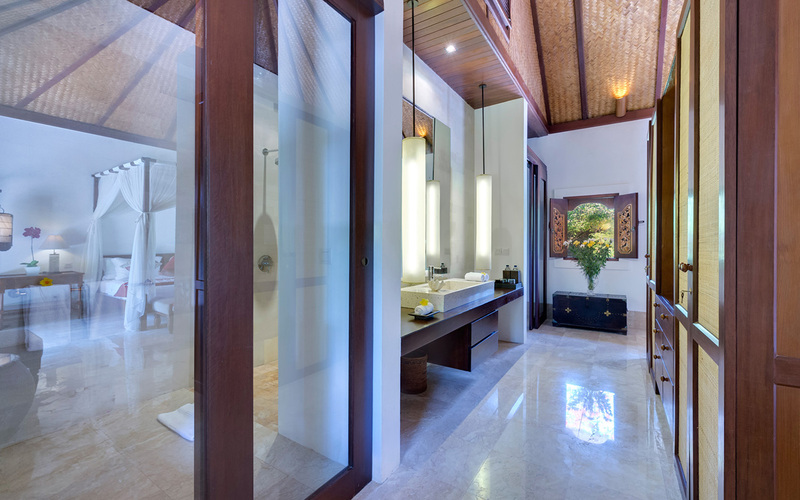 Stunning interiors matched by fabulous customer service by the villa staff made this a holiday to remember. 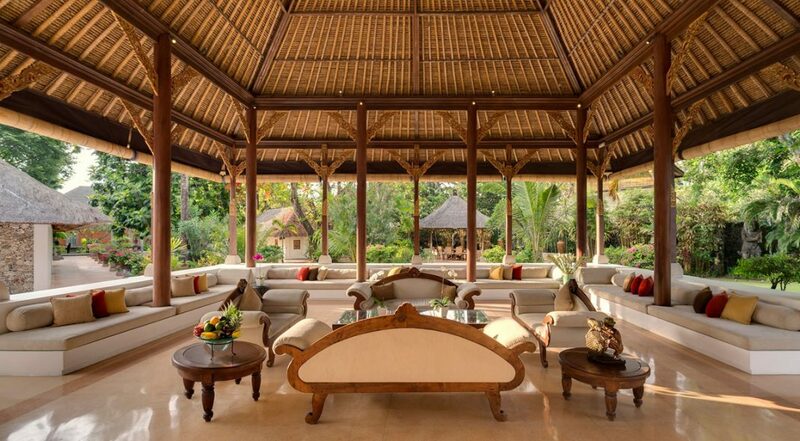 Peaceful, quiet with a very relaxed and 'beachie' atmosphere. 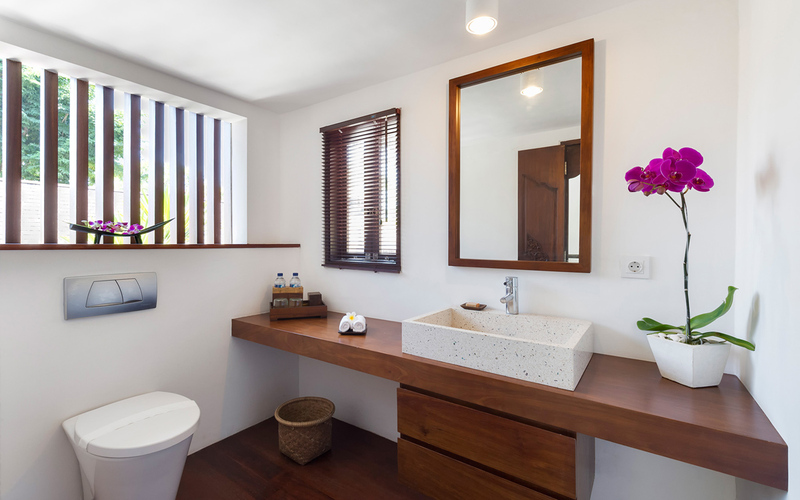 This was serious luxury and we must say really good value. 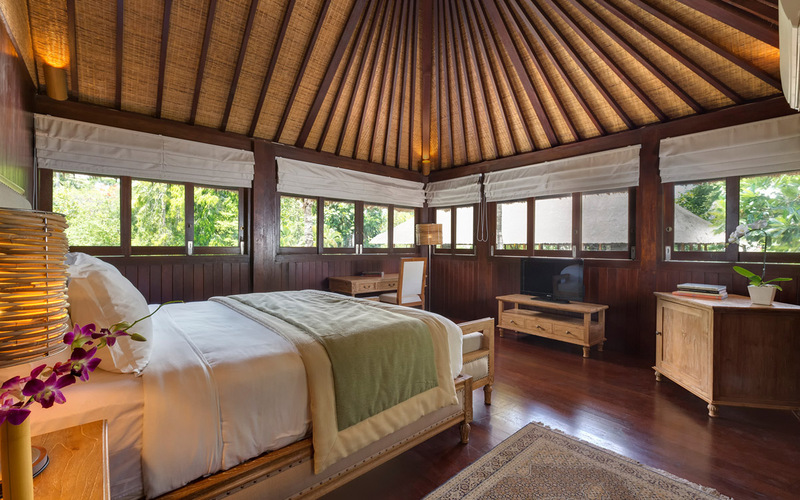 If you looking for a chilled out and family friendly accommodation we would have no hesitation in recommending Villa Batujimbar. 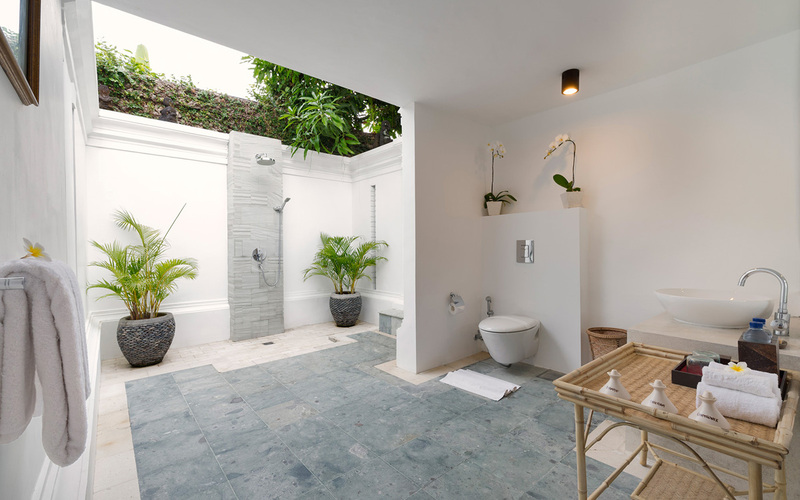 A gorgeous villa, out of this world customer service by the staff. 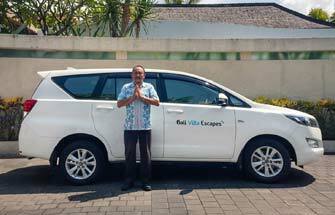 Our family stayed at Villa Batujimbar for 8 days to celebrate my the 25th wedding anniversary of my parents. What a great experience. Lot's of happy memories here. There were 12 of us which meant we wanted space and room to move about. 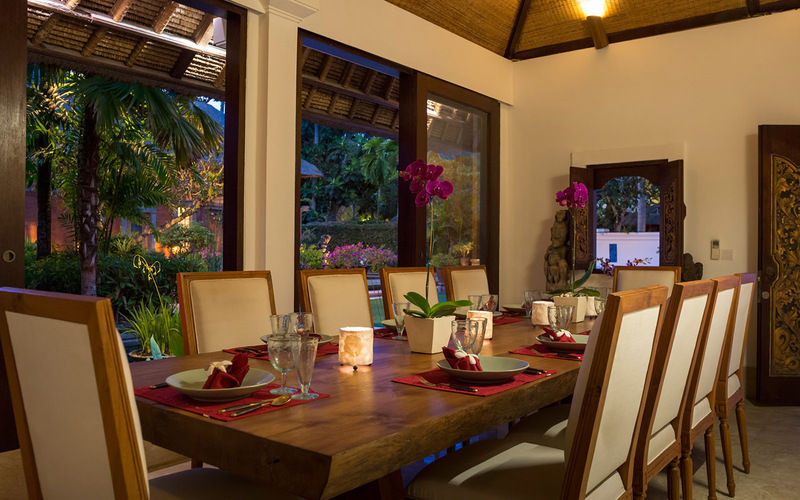 The villa was perfect for this and was made even better by the staff and the Chef Noora who was there cooking us fabulous Indonesian and Balinese cuisine every day. 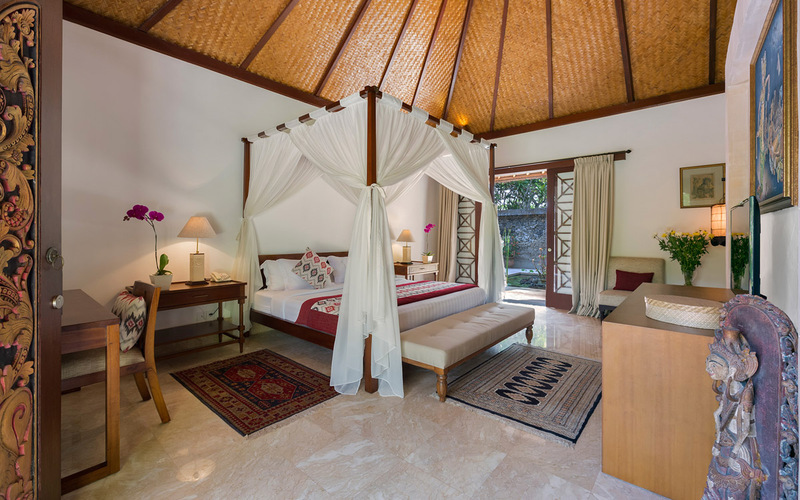 The villa itself is outstanding with everything you could possibly want to make your holiday perfect. 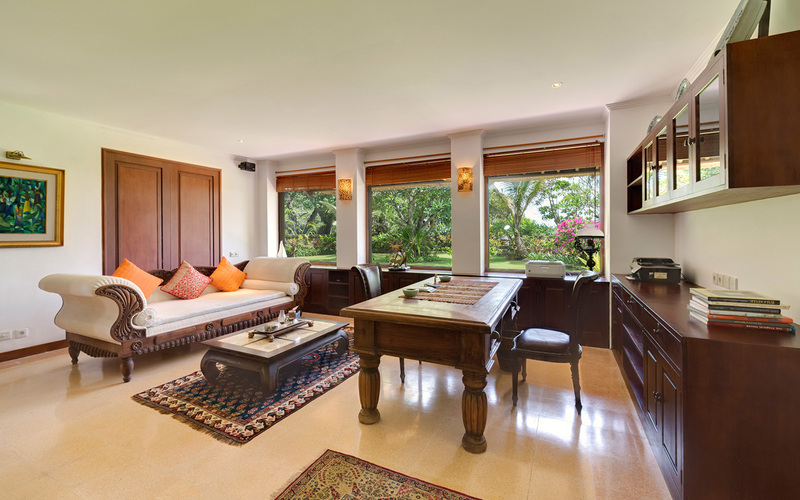 Rooms were cleaned daily as was the living areas. Easily a 10 out of 10! 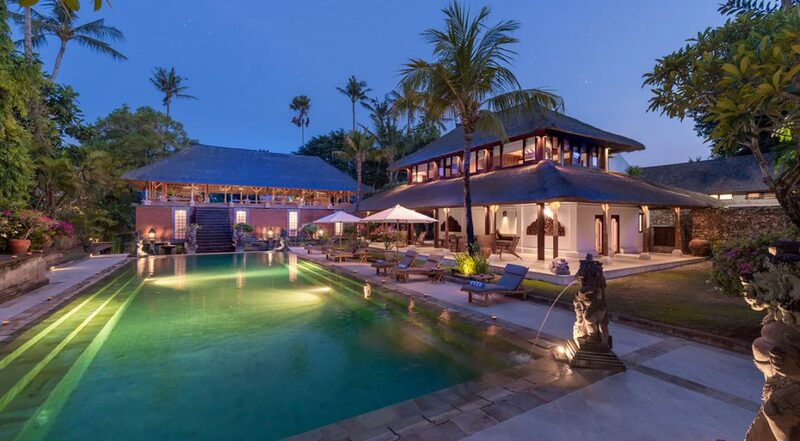 Was lucky enough to be able to get this villa over the New Years period. 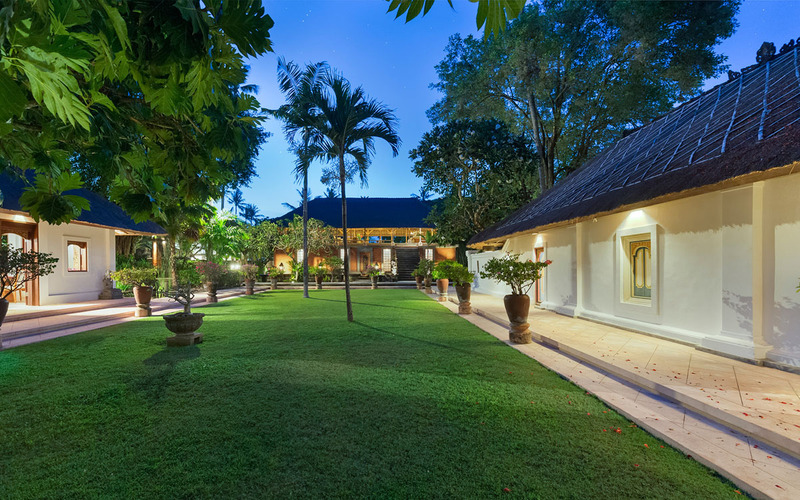 The level of service we received from the staff was world class as was the facilities and the swimming pool and garden area. Not to mention the fact that we had a beach all to ourselves - how FABULOUS!!! 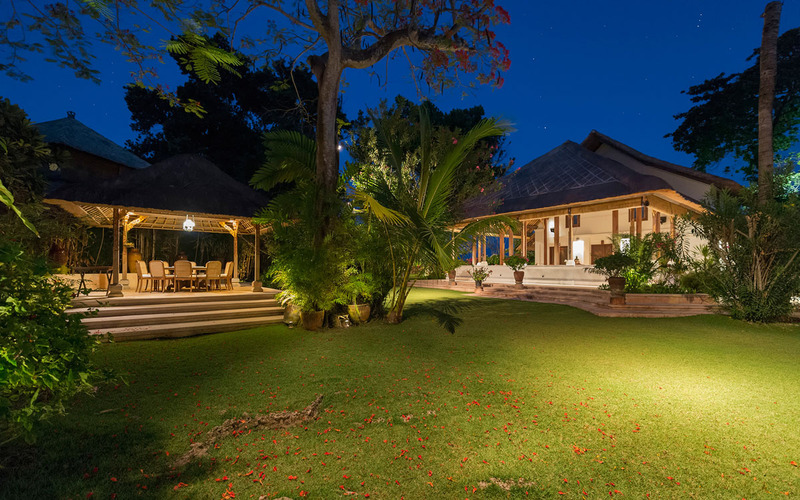 The villa is so so much better than the photos. Make sure you utlilise the beach as there's some really great snorkelling right outside. The scenery being right the beach was far better than expected. It was so quiet and perfect to spent lots of time reading and living the quiet life for a week. 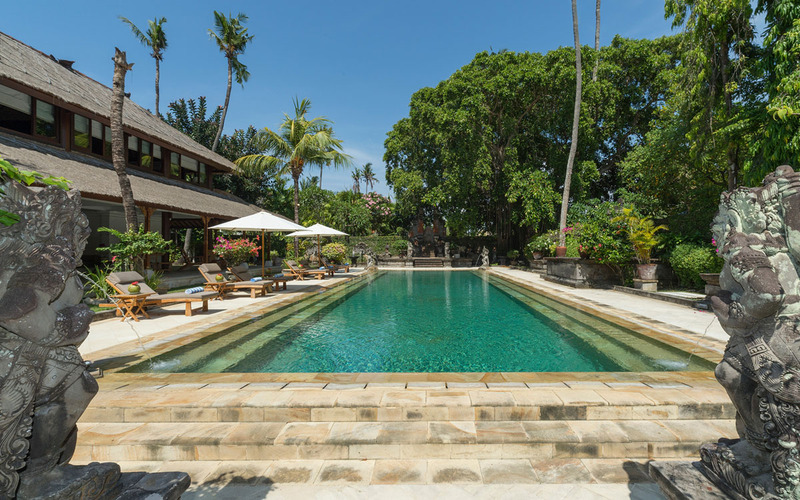 The pool, gardens and the entire villa was immaculate. We absolutely loved holidaying here with the family. It was a one of a kind experience - you really have to keep reminding yourself that this is not some kind of dream. Definitely coming back. Could not be happier. 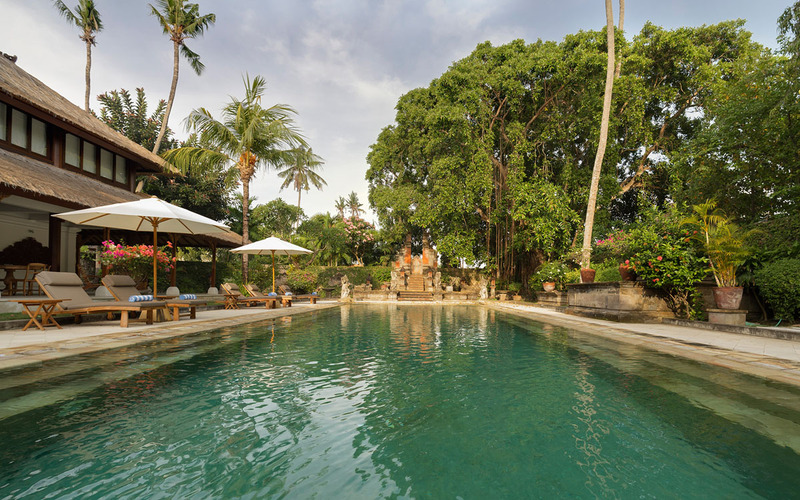 Thanks to everyone at Villa Batujimbar for probably one of the best holiday's of my life.